With a modern look and strong design, this vanity will help any bathroom look nicer. Its white marble counter and white solid wood base will look beautiful in your home. Its drawers and roomy double-door cabinet are great to keep bathroom items in. Put together your perfect bathroom with this stylish vanity set from Wyndham Collection. Use this vanity to bring more modern style into your bathroom. The good-looking white marble counter and white solid wood base make a big difference in your bathroom. There's plenty of space for items in this vanity's drawer and single-door cabinet. This classic set from Wyndham Collection will make your bathroom look brand new. Bring a fresh, modern look into your bathroom with this vanity. Its white marble counter and white solid wood base will look beautiful in your home. Made with a roomy single-door cabinet and drawer, this vanity has lots of room to keep items like toothpaste, towels, and hair brushes. Bring a classic look and feel to your bathroom with this beautiful set from Wyndham Collection. 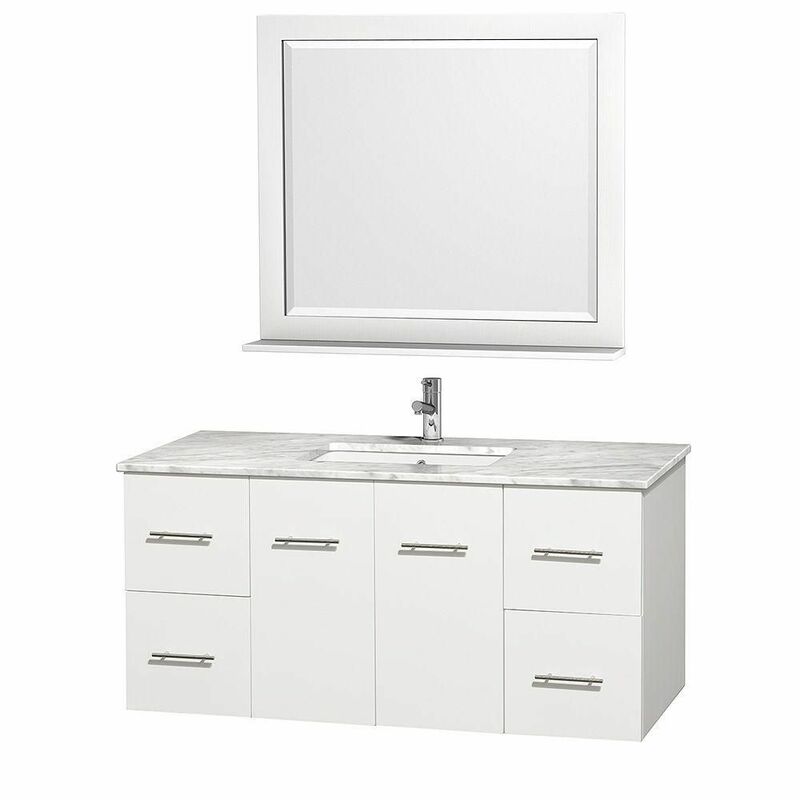 Centra 48-inch W 4-Drawer 2-Door Wall Mounted Vanity in White With Marble Top in White With Mirror With a modern look and strong design, this vanity will help any bathroom look nicer. Its white marble counter and white solid wood base will look beautiful in your home. Its drawers and roomy double-door cabinet are great to keep bathroom items in. Put together your perfect bathroom with this stylish vanity set from Wyndham Collection. Centra 48-inch W 4-Drawer 2-Door Wall Mounted Vanity in White With Marble Top in White With Mirror is rated 4.0 out of 5 by 7. Rated 5 out of 5 by Betty from I like the warm grey color and the modern look.... I like the warm grey color and the modern look. The bathroom is not yet completed but it appears it will be very functional. Rated 3 out of 5 by Hoss from This looks good, average quality. I was very disappointed to... This looks good, average quality. I was very disappointed to find out after I got the package that the top does not come with any back splash. I tried hard to see if they would sell it to me and no luck as they don't even offer it!!! I even tried calling several places to see if I can match the top myself to purchase back splash separately and was not successful. I believe for an expensive item, the company should at least offer option to purchase back splash. Rated 5 out of 5 by jennifer from Modern and luxe This was the most expensive item for my bathroom renovation and well worth the price. It's a statement piece but with a clean and modern look. The drawers are deep and spacious. Only issue is that it's heavy so my contractor had to add extra metal beams into my wall to ensure it would hold up as it's wall mounted.